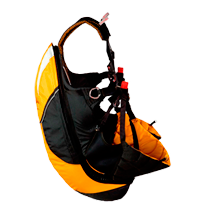 For one tandem wing : weight 6-10 kg (total equipment weight approx. 20kg) ; Horizontal speed 20-50 km/h ; Minimum sink rate 1-1.5 m/sec ; Finesse 8-9 ; Surface area approx. 40 m². The pioneer of "foot-launched flying" was David Barish, an American who first took to the skies under a wing made of mere fabric and strings in the early 1960s. He was a man ahead of his time, paragliding’s rebirth not occurring until more than a decade later when in 1978 a group of skydivers, using very basic equipment, took off from Pertuiset, a beautiful grassy hilltop situated 1000m above the village of Mieussy, just 12km away. And so "slope soaring" began. As the seasons passed, word spread of the passion this new sport instilled, and in 1985 we witnessed an explosion of the activity across multiple regions. Slope-soaring became known as paragliding and hundreds of the newly initiated carried the same message to every corner of France and the Navarre, eyes bright as they exclaimed : "I paraglided - I flew, it’s fantastic !". Paragliding remains the newest of air sports, unmatched in its simplicity and the speed at which it developed. 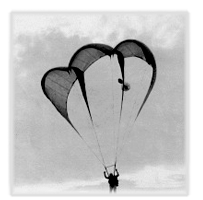 Since those very first flights paragliding wings have evolved considerably. They are approved only after meeting very specific standards and tests, and now offer more performance, comfort, safety and of course... fun !